The Shotgun engine for Softimage establishes a bridge between the Shotgun Pipeline Toolkit apps and Softimage. It contains PySide/Qt distributions, making it possible to write apps using Python and PySide that run right inside the engine. This document refers to more advanced configuration setups. This item has been tested and is known to be working on the following application versions: 2012, 2013. Please note that it is perfectly possible, even likely, that it will work with more recent releases, however it has not yet been formally tested with these versions. 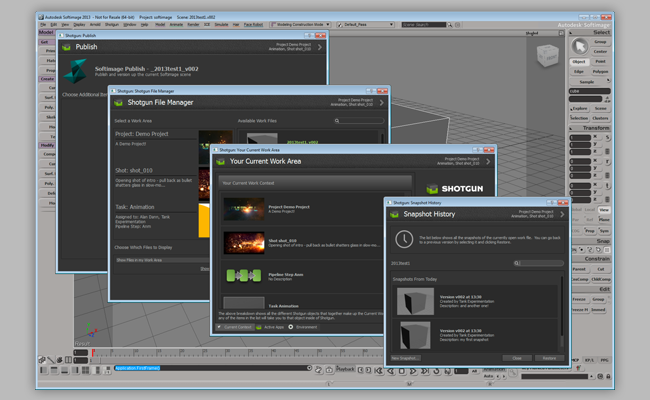 The Shotgun engine for Softimage contains a standard platform for integrating Shotgun Apps into Softimage. The engine supports the usual suite of apps providing automatic file management, a well defined work-area/publish workflow, snapshot, etc. Available Toolkit commands are displayed here. Please note that the Shotgun engine for Softimage is in beta and there are a few known issues - please see below for a full list. 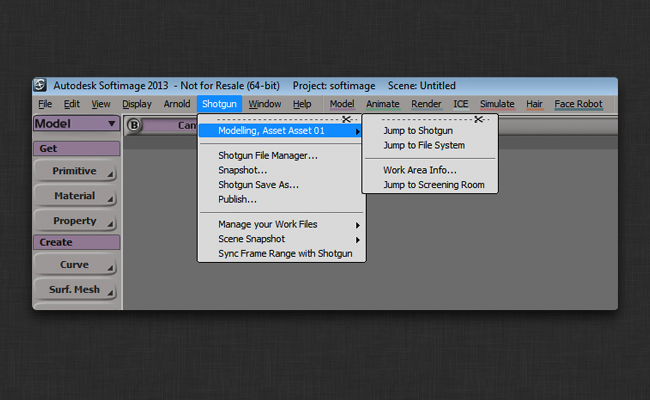 The Shotgun engine for Softimage currently supports Softimage 2012 & 2013 on Windows and 2013 on Linux. Softimage 2014 is not currently supported on Linux and whilst it can be run on Windows, there are some instability issues so it's use is definitely not recommended! If 2014 support is a priority for you, please contact toolkitsupport@shotgunsoftware.com. Under Windows, Softimage can be configured to use either the built-in Python distribution or an external distribution - see http://download.autodesk.com/global/docs/softimage2013/en_us/userguide/index.html?url=files/userprefs528.htm,topicNumber=d30e797817 for further details. The engine is bundled with versions of PySide & Qt for the installed versions of Python for Softimage, versions 2012 (Python 2.6 x64), 2013 (Python 2.6 x64) & 2014 (Python 2.7 x64). However, if you are using an external distribution of Python then you should be sure to provide a binary compatible version of PySide & Qt as well. Under Linux, Softimage has to use the built-in version of Python. For Softimage 2013, a pre-built distribution of PySide & Qt is required and provided by tk-framework-softimageqt. This distribution has been built using GCC 4.1.2 for Python 2.5.2, the same versions used by Softimage 2013. Although the engine will run under Softimage 2014 on Windows there are known issues and it hasn't been fully tested. Opening the Publish dialog will cause Softimage to crash! The _ssl.pyd file distributed with Softimage 2014 contains a known bug which may cause slowdowns at startup. We recommend backing up and then overwriting this file with the _ssl.pyd file you can find in Maya 2014 in order to resolve these issues. If you need more help or advice with this, don't hesitate to contact the toolkit support. Qt windows created without a parent and without using the engine's show_modal or show_dialog methods will not be parented correctly to the main Softimage application. In addition to requiring a very specific version of PySide (detailed above), Softimage is also missing ssl and sqlite3 libraries required by the Shotgun Python API and Toolkit. If you are using this hack then you will probably get segmentation faults during calls by Qt to the libX11 library (SIGSEGV in the call stack) resulting in frequent crashing. This is because the hack version of the libX11 library is quite old and not compatible with the version Qt was built against! If you are using a recent version of openssl, not built using the correct version of GCC (4.1.2) you may see Segmentation faults (SIGSEGV) when the Shotgun API is used. This isn't specific to Qt/PySide but worth mentioning here as it's the second most common problem! for instructions on how to build a compatible version of openssl for Softimage 2013. Currently, Toolkit windows are not parented to the main Softimage application window on Linux. As a work-around they are created to be topmost but this can sometimes mean that other windows (particularly confirmation dialogs) can be hidden behind them. If Softimage seems to have hung, try moving any open Toolkit windows to see if there is a dialog hiding behind it! You will find that when you move a modeless dialog (e.g. the Shotgun File Manager), the contents of both Softimage and the dialog will appear to freeze/hang. This is an issue to do with the way the Qt message queue is currently implemented but unfortunately we are yet to find an alternative solution! As a simple workaround, when this happens if you just click in the main Softimage Viewport, you will find that everything starts working correctly again! If you have access to the Shotgun Pipeline Toolkit, you also have access to the source code for all apps, engines and frameworks in Github where we store and manage them. Feel free to evolve these items; use them as a base for further independent development, make changes (and submit pull requests back to us!) or simply tinker with them to see how they have been built and how the toolkit works. You can access this code repository at https://github.com/shotgunsoftware/tk-softimage. Split out PySide & Qt distributions into a seperate framework to reduce the engine size. Dialogs created with show_modal & show_dialog are now released correctly when closed. Experimental Release to the App Store.